The best cherry blossom inspired items will help you create the perfect ambiance at your reception hall. From centerpieces to table settings with creative and inexpensive options can transform your reception hall into a romantic place where your guests will be surprised. Chopsticks, fans, lamps, place cards and other details should balance across the venue to create the Asian flavored theme. Chinese décor and oriental touches mostly in pink, red and gold will exude on your day. Here are our picks for your cherry blossom themed wedding. If you are looking for a simple and creative option to set up your tables, these table runners are the solution. Placing them on top of white linen can create ambiance effortlessly for your party. Spread cherry blossom petals or table jewelry along them to accentuate the décor. You can place some pillar candles on top of the runner for a romantic yet simple centerpiece and/or table arrangement. These white oval boxes are made from wood and feature a lid that has a large pink cherry blossom on top that acts as a place card holder. The box itself can hold any sort of treat you can think of, like jelly beans, chocolates, Jordan almonds or your favorite candy. Place them as part of your table settings to add to your decor. When the party is over, they serve double duty as a stylish favor your guests will go home with. They can be used to show off pictures or even store jewelry. Another way to bring the beauty of the cherry blossoms to your venue, is by using decorated paper lamps. 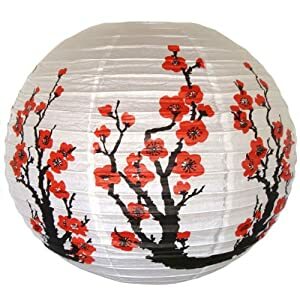 Whether you choose red or pink sakura designs to go along with your theme, paper lanterns are a great and affordable option. If you are creative enough, these lamps can be used as part of an original centerpiece. You can use Eiffel tower vases to elevate them and LED lights instead of a cord and bulb to light them up. Parasols are a great idea to bring an unusual element to your décor that actually fits perfect with your theme. 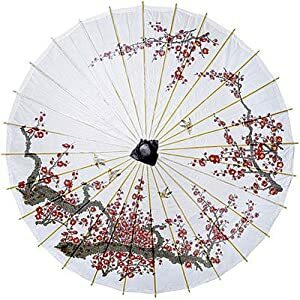 If you are looking for that wow factor, which is also romantic, vintage and elegant these parasols with a cherry blossom design are a must for you. 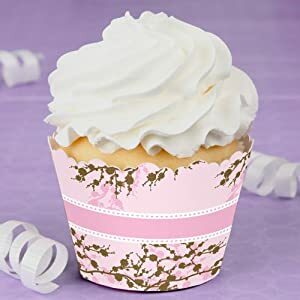 You can place them on your tables as a fantastic yet simple centerpiece, or you can spare them throughout the reception hall as part of the decorations.